Cardi B is cheering on this young cookie seller! There's no doubt that in today's day and age (with all sorts of ways to advertise on social media), Girl Scouts are getting very creative about how they sell cookies — especially if they want to be at the top of their troop. With a little inspiration from one of the world's biggest singers, one girl went all out to promote this year's sweet stash and the internet is absolutely loving it. Last week, Girl Scouts USA shared a video on Twitter featuring a 10-year-old Girl Scout named Kiki performing a remix to rapper Cardi B's song "Money." The original song, which is not really appropriate for younger ears, got a kid-friendly (and Girl Scout-approved) makeover by the innovative entrepreneur and her mom. Originally from the Los Angeles area, Kiki even mentions "Studio City" in her rap. More of Kiki's adorable lyrics include, "I got girls in my troop, cookies to roof," "Selling them cookies is my thing," and "Please real, not Monopoly money." She also mentions "black girl magic" in her video which, according to Girl Scouts USA, is a "rallying cry to celebrate the strength, resiliency and accomplishments of black women and girls who triumphantly succeed in a society where discrimination and inequality remains pervasive." On Tuesday, the video was even seen by Cardi B herself, who retweeted it to her nearly 5 million followers, saying "I want all the cookieshhh." So far, that tweet has generated nearly 11,000 retweets and 74,000 likes, while the Girl Scouts' original post has more than 22,000 retweets. Those numbers have translated into big cookie sales for Kiki, who has already doubled her original sales goal. Talk about a sweet success! The video has also generated some pretty hilarious memes and comments, with many on social media showing full support of the song. Honesty, who wouldn't love a song about Girl Scout cookies? If every Girl Scout was jammin cute remixes every time I came out of Publix I would buy a box.... or 3. 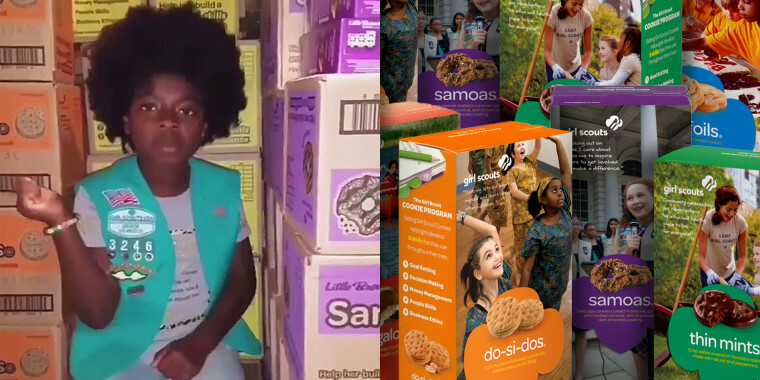 The wannabe Cardi B certainly isn't the first girl scout to get creative with her cookie campaign. In 2018, a scout in San Diego sold 300 boxes outside a marijuana dispensary in just 6 hours and a New York City-based troop with girl scouts who are homeless sold their goods from a Kellogg's Cafe last year. Even actress Jennifer Garner has gotten in the cookie-selling fun by helping her girls out during the high season. Want to get your hands a box (or three) of Thin Mints this year? Girl Scouts USA recommends using this link to find a local cookie booth by entering your zip code. And don't miss the newest cookie on the list for 2019: Caramel Chocolate Chip.